Episode 10 - Who is the Greatest? Episode 30 - Steal the Rations! 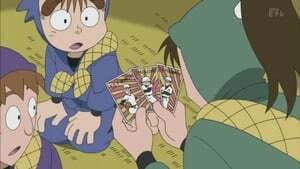 Episode 49 - Nintama Helpful Sword? Episode 53 - Save Ichinen-hagumi! Episode 57 - The Princess is? Episode 67 - It's Fake Money! Episode 68 - Who is the Criminal? Episode 72 - Goldfish Yaai! Episode 73 - The Cafeteria is Taken! Episode 74 - It's a Hotspring! Episode 75 - Hemuhemu is Missing! Episode 76 - Give Back Hemuhemu! Episode 77 - To Sose Temple! Episode 78 - Beat the Second Year Students! Episode 80 - Find the Weak Point! Episode 81 - I'm Full! Episode 82 - Be Cold-Hearted! Episode 83 - Obachan Catches a Cold! Episode 91 - And the greatest is?